Sand. Sweat. Sun. A cooling wind to follow, from jumping out of a plane. I stood on the edge of the dune in Swakopmund, Namibia. It looked impossibly steep and I thought of my shoulder surgery. It has been years, but it still sticks in my mind when I’m looking at the edge of something I’m about to slide down or jump off of at top speed. “I’m not going to believe that coming from someone who’s wearing a skydiving shirt,” joked Chris, the instructor, when I said I was a bit nervous to stand up-board down the dune face. The sand wasn’t like the icy snow in the mountains near home in California, though. It’s a fine, soft landing and though steep, not too difficult to learn on. Easily alternating between fast and slow with a heel and toe motion, the end of the run came quickly and left me wanting more. Hoisting the board back up, I eyed the dune once again. Another steep climb. I was going to have to earn these runs. From the top of the dune, a shining blue ocean beckons, as if teasing that only it can offer some relief from the heat. Skwakopmund sits on the Skeleton Coast in Namibia, nestled between the oldest desert in the world and the Atlantic ocean. For me it was an active place, full of far too many activities to try during my two days there. Reminiscent of its German colonial history, the town of under 50,000 people in a country of 2 million is an interesting mix of Europe and Africa. Markets with tribal wares sit alongside German-style cafes serving up sausages. It offers the small town charms of dive bars, Sunday farmer’s markets, people who recognize you after a day or two, and of course, a wide array of adventure activities. With so many choices such as quad biking, dolphin cruising, horse riding and skydiving (more on that later), sandboarding with Alter Action sounded the most unique to me and therefore was put at the top of my list. I did fall, but it didn’t hurt much. I did get pockets, ears, hair, and a mouth full of sand, but I didn’t mind much. Even two months later, I’m still finding sand at the bottom of my bag. It was worth it, though, and as big kids what’s better than playing in a giant sand box? Few things, I’d say. After the fourth run it was time to head off for skydiving with Ground Rush Adventures. 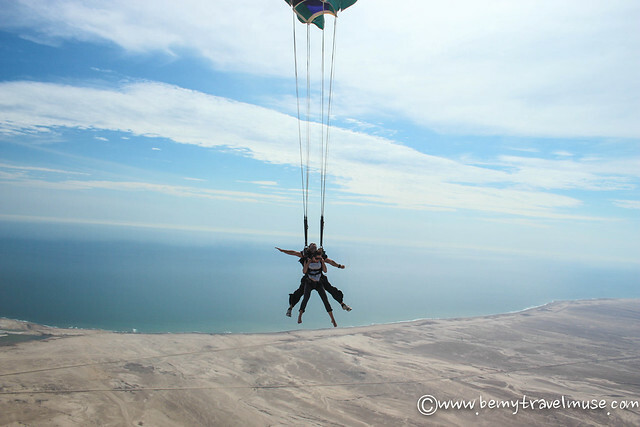 The day was packed but it was perfect because I didn’t have any down time to think about the fact that I’d be flying through the air, tempting fate and putting all of my trust in a parachute, soon. I wondered if it would be like bungee jumping. I still didn’t know how I felt about it a month after jumping off of Bloukran’s bridge in South Africa, the highest natural bungee jump in the world and the first I’d ever tried. 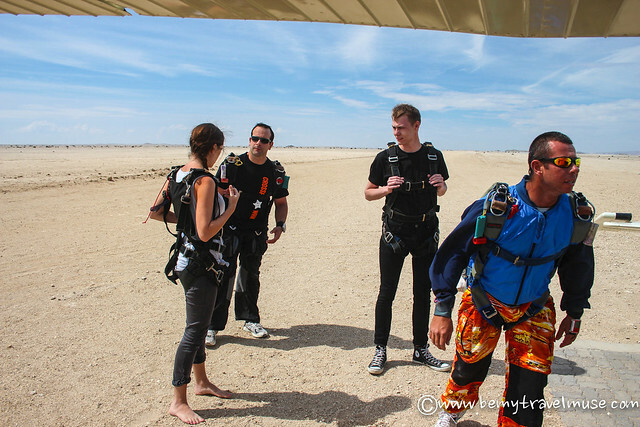 I met the guy I’d be jumping tandem with, Francois, and immediately felt at ease. He’s the kind of guy I’d be friends with, whether I was strapped to him and trusting him with my life or not. He approached it with such excitement and enthusiasm that it was hard for me to have any fear. Jumping barefood ’cause I’m ’bout that life doe. And suit-less, because if I don’t get to wear those red and yellow pants then I don’t want to wear ANYTHING. The scariest part of a skydive is the buildup. Sitting in the plane as it goes higher and higher, way past the point where it seems it should stop and with entirely too much time to think, is the worst. I was oddly relaxed and excited, though, knowing that I didn’t really have to do anything but spread my wings and fly. 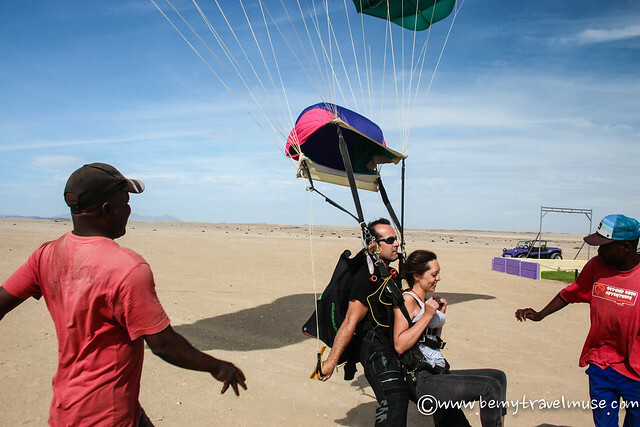 Skydiving was different, the rush of warm wind – so warm that I didn’t even need a jump suit – and the gorgeous setting sent so much dopamine through my brain that I instantly fell in love with the sensation. We spun quickly in one direction, me laughing and he pulling my hand down even harder so that we’d go faster, then in the other direction. I wanted it to last forever. As we touched down on the ground, a crowd of friends from my Acacia crew smiling and waving at the bottom ran over with hugs and a glass with brandy. Ever since that glorious day I’ve toyed with the idea of returning in order to get certified to jump solo. I could do that all day, every day, and never get tired of it. It looks like I’ve found a new addiction. *Acacia, Ground Rush, and Alter Action brought this post to you. However, you will never read a positive review on BMTM for an activity that I did not love. Your trust always comes first. Stay: For a rare moment we weren’t in tents in Swakopmund, opting for dorms at Amanpuri Guesthouse. It became a running joke in my safari group that the slogan of the place was, “a place to stay.” Not a “nice,” or “great,” place to stay. Just a place to stay. It was actually quite a nice place to stay, though, and I’d recommend it for affordable and clean dorms or private rooms. Sand Board: Alter Action was tons of fun to board with, and it’s super cheap at $45 for a full day with a DVD of your boarding misadventures (because pretty much everyone falls at some point!) included. Highly recommended. 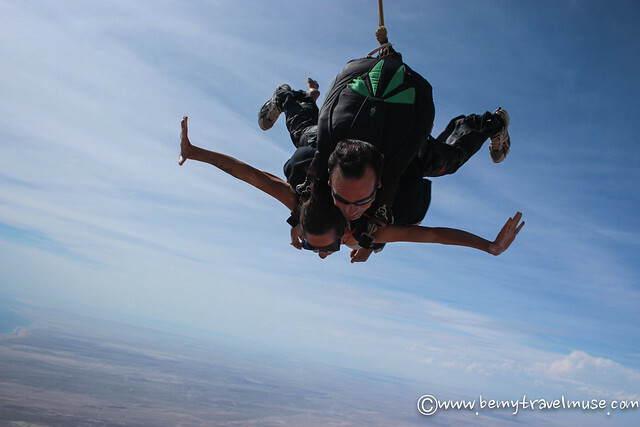 Skydive: Tandem dives run at the equivalent of $170. The crew is awesome and the view must be amongst the most beautiful in the world. 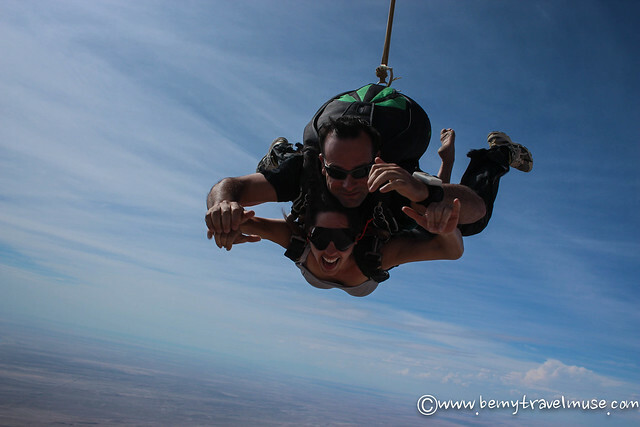 A common complaint of skydivers other places in the world is that the cold hurts their faces as they fall – not an issue in the middle of the desert. Love how you got all the badassery covered! Thanks for all the details of what exactly goes on in your mind while that plane is rising up :D. Also, that tank top in the 1st picture = dope! Thanks Archana! Yes all the sandy badassery! Haha. The plane going up is the hardest part – the rest is in the hands of the instructor anyways. I’ve always wanted to try sky diving. I like your description of it – and I think I like the idea of that more than bungee jumping. Now that you’ve done both, which do you prefer? I prefer sky diving for sure but I still do like bungee jumping and did something similar – gorge swing – in Victoria falls after this. You bungee then swing at the bottom. I loved it so much I went 3 times! That tank top rocks – I love finding unique shirts from places I go (not like, uhm Hard Rock !) and that has to be one of the cooooooolest. 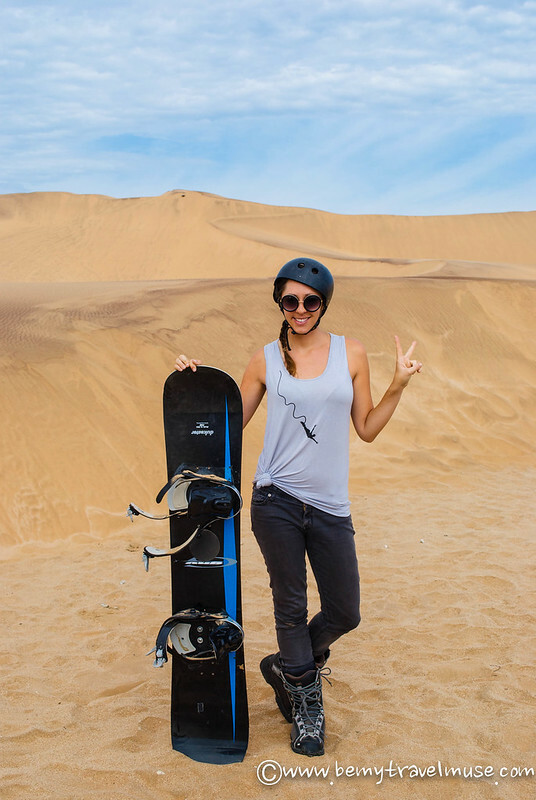 Can’t decide whether to sandboard, skydive, or take a nice flight over the dunes. So much to choose from! This is my dream trip! 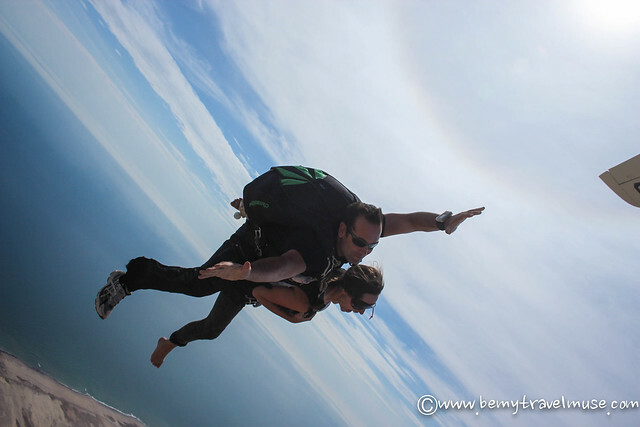 Probably the coolest place on Earth to Skydive. That’s awesome! It’s definitely up there in my favorite country list. So beautiful and with an endless list of things to do. That view really is amazing. I just got a rush reading your post so I can only imagine how much better it was like in real life! 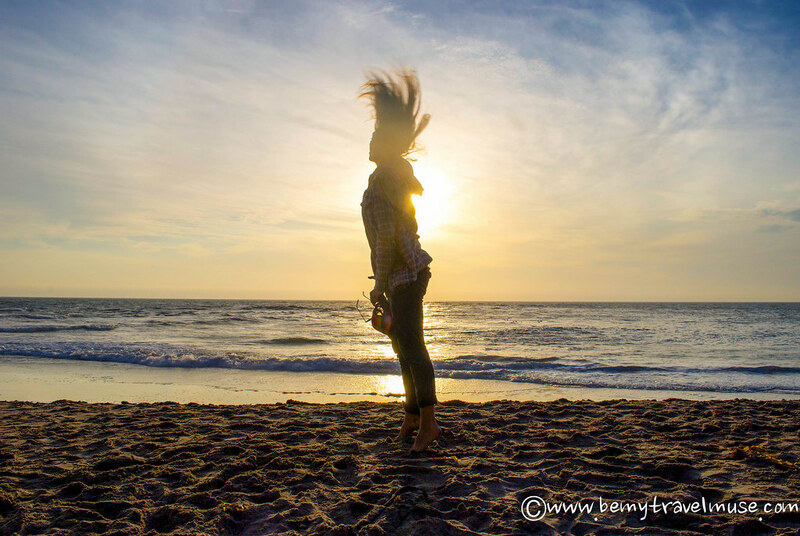 Thanks for all the great reviews on Swakopmund. It is our favourite place in Namibia and we often go on the weekends. A visit to Sandwich Harbour is another must-do.